@pickover @Derektionary This has not been unknown to the dabbler in such matters. The number 3 and 3/8 behaves in a parallel fashion. In fact, pleasingly, we can construct an infinite number of facts like this. We can also suppose that B < C (otherwise our mixed fraction would be a little odd) and that the highest common factor of B and C is 1, so that the fraction B/C is in its lowest form. We can use double implications (⇔) here since we know that everything is positive. Click HERE for another investigation of a maths tweet from Cliff Pickover. 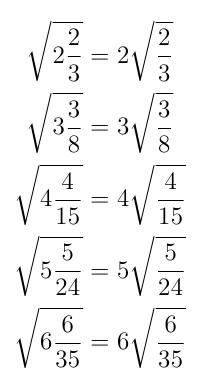 In these examples there should be a “+” symbol between the integer and the fraction that appear under the radical. Some one should correct this! It is implied summation on the left hand side, following the (somewhat idiosyncratic) convention of how mixed numbers are presented, but implied multiplication on the right hand side, following the convention of everything else in mathematics. I think it is correct as stated.